Pilfer: Gain three magicka this turn. 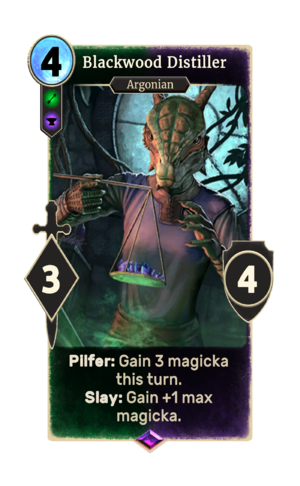 Blackwood Distiller is an epic Scout creature card. Blackwood Distiller was the monthly card for May 2018. It can be soul-summoned by anybody regardless of participation in ranked. As with all other monthly cards, the premium version was not awarded to anybody and must be obtained through soul-summoning. "The Hist heals and rejuvenates!" "Herbs can heal or harm." This page was last modified on 20 February 2019, at 15:47.